For instance, suppose we had a graph from a technical paper, and we wanted to extract numerical data from the graph lines. One way would be to measure the points by hand and calculate the numbers by scaling from the axes, but that would be inaccurate, error prone and tedious. Another way would be to scan the graph and paste it into a program that will return the screen coordinates of selected points, and scale the screen coordinates to graph coordinates. I have written a VBA program to make this procedure quick and easy: DigitGraph.xls (including full open source code). Paste the scanned image, and drag to a convenient size. Drag the rectangle so the bottom left corner is at the origin. Stretch the top right corner so that the left and bottom edges extend to points with known ordinates. Draw over the lines or shapes to be digitised, using a single freeform shape for each line. Give the drawn shapes any unique name. Enter the Digitgraph function as shown below, where XLen and YLen are the true length of the X and Y axes. If the origin has non-zero coordinates enter Xorigin and Yorigin. The function will return a list of coordinates of the traced lines, to the scale of the X and Y axes. 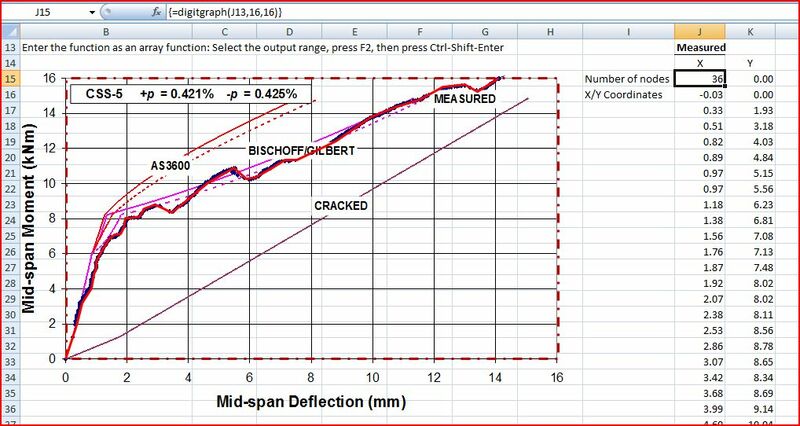 Example output is shown in the screen shot below, using a scanned graph of a beam deflection experiment. The DigitGraph function results are on the right, showing the number of points in the traced polyline, followed by XY coordinates, to graph scale, for each point. This entry was posted in Drawing, Excel, UDFs, VBA and tagged digitize scanned image, Excel, UDF, VBA. Bookmark the permalink. This is very nice and handy too. It only works with linear axes, though. This tool with logarithmic axes support would have been a killer back then! Good idea! See my latest post. And good luck with your new blog! Thanks a lot, I’m looking now. This looks very flexible but I need an explanation of how to give a name to a shape. How did you give the name ‘measured’ to the red line? Nick – select the shape by clicking on a boundary, then type the name in the name box in the top left hand corner. When the shape is selected the name box will display the default name (something like rectangle 3). You can just type over it. You can do the same thing to name a range by the way. Great work, thank you. I still get “artifact” point (the first one with a very large x coordinate). I have been looking for something like the DigitGraph Function for a long time. Thank you so much for a) figuring out this elegant solution, b) for even sharing it, c) even for free. It’s just so beautiful. Thank you so much. You are my HERO! Doug, awesome tool! As a geotechnical engineer I have to plot lots of data into graphs from several authors, which your function made a lot easier. Thank you so much for sharing this tool, keep up the good work!